Electro-say what now? What is electrolyzed water? Electrolyzed water is a simple industrial-grade technology that’s been around for 50+ years. 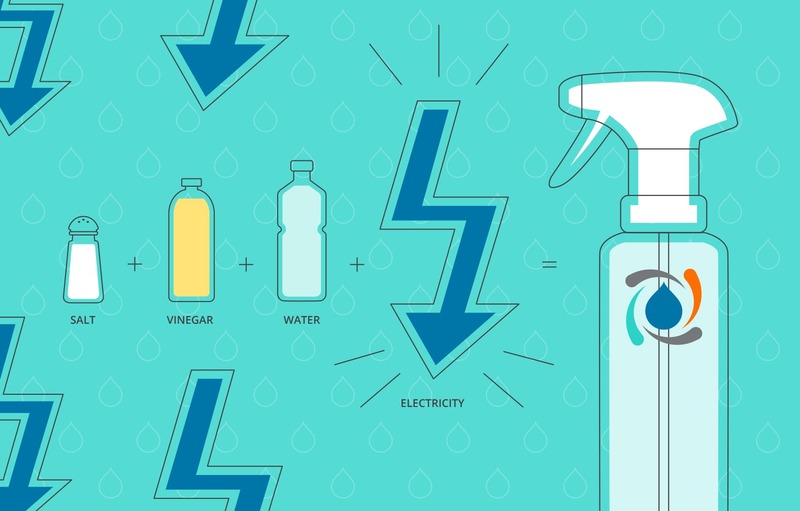 It uses electricity to change the chemical structure of salt, water & vinegar into a cleaner & disinfectant as effective as bleach, but with no harmful chemicals. Crazy right? Who’d have ever thought electricity could turn 3 simple ingredients sitting in most families’ kitchen cabinets into something so powerful? You might also be surprised to know that it’s so gentle, it’s commonly used in wound healing and veterinary care products. And because it’s so effective at cleaning & sanitizing without harmful residues, it’s also used in food applications. It’s FDA approved for use in produce preservation and USDA approved for organic crop production. How is electrolyzed water made? Think back to middle school – forget the acne and braces and just focus on chemistry class. The process starts with the correct proportions of salt, water and vinegar. You may remember that a salt molecule is made up of the elements sodium and chloride (NaCl) and a water molecule is made up of hydrogen and oxygen (H2O). When an electrical current is applied to the solution, the molecules break apart and the elements are scrambled up to form two new molecules: Sodium hydroxide (NaHO), a common detergent and hypochlorous acid (HOCl), a natural disinfectant & sanitizer that’s as powerful as bleach. It’s actually the same substance your immune system produces to fight infection. The vinegar lowers the pH (acidity) of the solution so that just the right concentrations of hypochlorous acid & sodium hydroxide are created. The result is a cleaner, disinfectant and deodorizer that’s just as effective as conventional cleaners but with no harmful chemicals, residues or fumes. The concentration of sodium hydroxide is miniscule – only 0.0000003% – vs conventional cleaning products which have up to 5%. If electrolyzed water is has been around so long, why am I just hearing about it now? The technology to make electrolyzed water has been around for years, but it required expensive, industrial size equipment accessible only to large institutions like hospitals (in the US & Japan) & businesses. Until now. At Force of Nature, we’ve miniaturized this industrial-grade technology to fit on your countertop. Our small appliance with its patented electrolyzer converts tap water, plus a capsule of salt, water and vinegar, into a powerful multipurpose cleaner, disinfectant and deodorizer that’s as effective as bleach yet totally free of harmful chemicals. Because we believe you shouldn’t have to trade powerful cleaning for family-friendly ingredients. Click here to learn more.